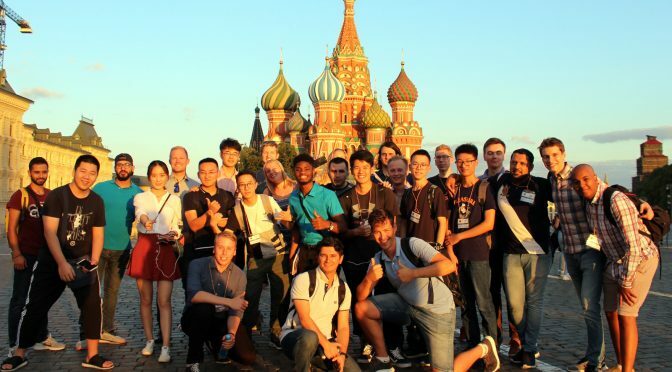 During 29 July -5 August 2018, Gubkin Russian State University of Oil and Gas, Moscow, gathered more than 70 students from Europe, Asia, Africa and Latin America to attend the intensive course of lectures and seminars on modern technologies, development, well construction and logistics in the Arctic region. The summer school in Moscow is one of the events of Arctic Logistics project (2017-2020) within the frame of UTFORSK program where Molde University College and Gubkin University are the main partners, together with three more partners from Russia (Higher School of Economics, St Petersburg State University and Institute of System Analysis of Russian Academy of Sciences) and two Norwegian partners (Sintef and Møreforsking Molde). One of the project’s main goals is to strengthen the academic background of students by inviting the best lecturers from other universities and industry as well. This year Gubkin offered students to participate in three different summer schools: “Technology for efficient and safe Arctic development”, “Arctic logistics” and “Modern technology for well construction”, organized in cooperation with Molde University College, University of Stavanger (within the frames of the UTFORSK program) and Leoben University. “Nowadays, along with rapidly developing technological industries, the higher educational institutions face the problem of short life-cycling too,” said the rector of Gubkin University, professor Victor G. Martynov in his welcoming speech. “While the teaching staff is creating the study programs and implement it in the universities, most of the programs become outdated by the end of the study period. Winter and summer schools are intended to cover up-to-date aspects of the industry and share the knowledge through the case studies of recent real-world examples under the leadership of scientists and specialists from all over the world. It helps to expand professional horizons in a “smart” way,” added Martynov. Anastasiia Vysochyna, Cecilie Maria Camitz-Leidland, Andres Haugen Vikhagen and Elmira Tukaeva, second-year master’s students in petroleum logistics, logistics analytics and supply chain management programs at HiMolde (Editor’s note: Tukaeva is the author of the article) participated in the “Arctic Logistics” summer school together with the second-year master students in the petroleum logistics program – Angelina Angelova, Vladislav Zamyatkin and Artyem Vinogradov – who were studying their second semester at Gubkin University as a part of the two-diploma joint master’s program between HiMolde and Gubkin. The team of lecturers from HiMolde included professors Irina Gribkovskaia, Katerina Shaton, Yury Redutskiy and PhD student Markus Brachner working at Sintef. During the joint lectures all participants discussed the challenges and issues of oil and gas in the modern world, risks for offshore operations and logistics in the North Pole area, integration of big data and future energy trends. It helped students to eliminate their lack of understanding on what are the real consequences of Arctic exploration. Also, each summer school’s participant attended the seminars based on his/her fields of study. The expert opinion of international scientists and existing examples from industry professionals of upstream and midstream production chain have largely contributed to the success of the summer school. The case study competition was dedicated to the action plan for an oil spill accident in the Caspian Sea, a competition the team of HiMolde successfully won. Although other teams have had their expertise in petroleum and chemical engineering, geophysics and applied geology, the compact group of future logistics specialists showed fruitful team work and delivered the best solution in a limited time frame. While the topic selection for joint lectures and its dispersion between the three different summer schools have been criticized by a few students, all participants agreed on the professionalism and sincere hospitability of a volunteer team from Gubkin University – the activists from Society of Petroleum Engineers (https://www.spe.org/en/). Since the last summer and winter school in different Russian towns, the volunteers have gathered feedback from previous students. They managed to improve many aspects and create a new cultural program to strengthen the informal communication between the international students, and also dissolve the Russian intimidating image. Every evening was brightened up by various cultural and social events as excursions to the Red Square and the Tretyakov Gallery, Moscow River cruise, the tasting of local food and dancing at the Russian party where every student felt safe and shared the memorable and joyful moments. Fabulous Moscow after FIFA World Cup 2018 – and sunny weather – made the atmosphere between participants warm and friendly, and laid a foundation both for professional and social cooperation in the future. Cecilie Maria Camitz-Leidland: The Summer School in Moscow has been a very valuable experience for me. I have gained a lot more knowledge about Arctic logistics, a topic I find very interesting. Earlier this year I also participated in the winter school in Arkhangelsk. Together, both schools have helped me in the process of choosing a topic for my master thesis. Overall, I have really enjoyed my stay in Moscow and it has been wonderful to visit the city during the summer season. Anastasiia Vysochyna: If to compare the winter and summer schools on Arctic logistics, I would say, that Moscow school was more concrete and specific. We got the knowledge related mostly to the fields of our studies, while the winter school covered the general aspects of Arctic development. Lecturers from different countries have discussed the current challenges, the principles of modern technologies and existing situation in Arctic with its specific features. The summer school helped me to systematize the information I’ve got and helped me to choose the topic for my master thesis that I’m really interested in.